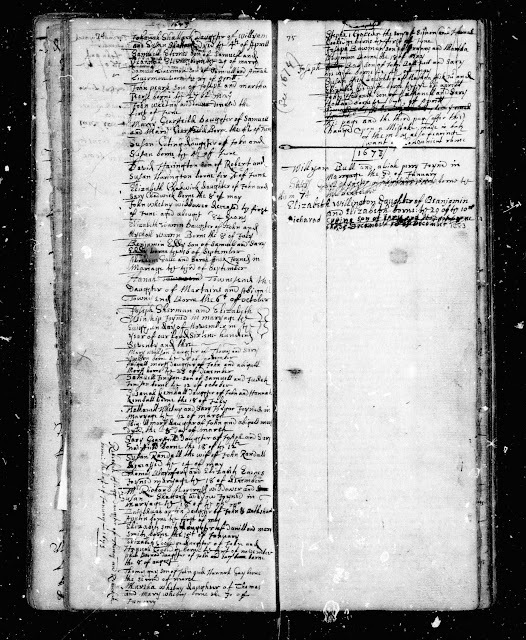 maryage the 12 of march "
Massachusetts, Town and Vital Records, 1620-1988, digital images, Ancestry.com (http://www.ancestry.com : accessed 15 February 2017), Watertown > Births, Marriages, Deaths, 1673 (image 157 of 3991), Nathanell Whetny and Sary Hagar marriage entry; citing original data from Massachusetts town and city clerk records in Jay and Delene Holbrook, Massachusetts Vital and Town Records (Provo, Utah : Holbrook Research Institute), Microfiche collection. Nathaniel Whitney (1646-1733) was the son of John Whitney (1621-1692) and Ruth Reynolds (1623-1706). Sarah Hagar (1651-1722) was the daughter of William Hagar (1620-1684) and Mary Bemis (1624-1695). They married in 1673/4, and had 8 children between 1676 and 1700. I am descended from their third child and second son, William Whitney (1683-1720), who married Martha Peirce (1681-1759) in 1706 in Watertown. I. Guess we are related because they are my 7th great grandparents.